'I dare not say anything more.' Ah, if only these words were acted upon on a more regular basis by Pope Francis, we would not have half the confusion that now exists. Why say, 'yes' or 'no' to a question when a thousand incoherent words will suffice? As if to confirm the content of all those unconfirmed Scalfari interviews, the Pope places a spotlight once again on the 'supreme role' of personal conscience on reception of Holy Communion. What he neatly overlooks, however, is that the question from the Lutheran woman is a direct question asking the Successor of St Peter to educate her conscience. This, and this is a recurrent theme of this papacy, is a duty he deftly avoids on crucial matters pertaining to the Faith. Whatever she takes away from his response, her actual conclusion will surely be that the Pope has nothing to say to the consciences of non-Catholics, nor to the consciences of even Catholics. Make no mistake, we have, in Pope Francis, an embryonic new dogma, while not one universally accepted by the Catholic Church, which turns 'do whatever He tells you' into 'do whatever you think best according to your lights' and the post-Synod of the Family Church should be left in little doubt that, ultimately, this is a message that Pope Francis seems to sink into the minds of Catholics and non-Catholics alike. The really frightening thing about it, is that the Eucharistic Lord is being callously used in this way to advance an agenda. In the Eucharistic Jesus, clearly Pope Francis believes there is nothing, Nobody, to protect. Nor is safeguarding souls, it would seem, from profaning the Eucharistic Lord, a priority. You might very well think that if - and I know this is radical - the Lutheran woman one day decides that she no longer sees any obstacle to becoming one with Jesus Christ in His One True Church, that there may come a time when she can receive Holy Communion - because then she would be in full Communion with the Church, but I don't know whether if you believe that, you are really on Pope Francis's wavelength. From his perspective, perhaps, this whole conversion thing is a bit backward, an outmoded concept that has kept adulterers, souls in mortal sin, manifest heretics and schismatics from the 'brotherhood' to be found in the Catholic Church. It would seem that in the Pope's view there are issues of conscience, even for him. This is implied by his 'I dare not say anymore' comment at the end of his reply, but we're left in doubt as to whether he dares not to say anymore on the matter because he wishes not to imperil her soul, or his, or whether he is worried that Cardinal Kasper may disagree with him, or that those 'rigorist' faithful Catholic bishops, priests, cardinals and laity might disagree with him and call him out on it. Why does Francis not consider the conscience of the other person involved in the reception of Holy Communion? Yet this issue of conscience is a lot more thorny than the Pope will publicly say because while His Holiness, on such crucial matters of faith and morals, sends the 'conscience' ball back into the court of the layperson or the non-Catholic of another denomination what we never hear from him is a defence of consciences of those who are charged with the duty to protect the Blessed Sacrament as custodians of the Eucharistic Lord. Who His Holiness never considers in this kind of banter around Holy Communion is the parish priest. It is as if, like an evil Government that wishes to instigate war, bloodshed and finally martial law in a civilian population through covert false flag operations, the Holy Father wishes to instigate war between the uninformed or dulled consciences of the persons sitting in the pews and the priest whose conscience is served not necessarily by giving Holy Communion to all people, no matter what, but undergoing his own 'discernment' as to whether to give Holy Communion to someone whose salvation, he may judge, is served better by refraining until a particular time in the future when the person is properly disposed to receive it. This Peronist call to 'the people's consciences' is terribly damaging, unfathomably so. Francis is not just setting himself up against the Church in order to oversee 'reform', but he is, through statements, homilies and interviews, setting himself against priests, priests against priests, bishops against priests, bishops against bishops, cardinals against cardinals and laity against the priests set in authority over them, not to do the will of the crowd, not to heed the 'beats of the age' or even the 'voice of the people' but to do the will of the One who set them apart and sent them, to feed them, teach them and care for their souls. This ambiguity, willed or not, serves an agenda which is incredibly destructive within the Church. Pray for priests, pray very much for the clergy, who, I am certain, still pray for the Chief Shepherd and Father in God everyday, but must by now long for God to place over them someone who supports, protects and encourages them in their priesthood, rather than threatens to leave them wide open to and completely unprotected from attacks from the enemy of God and mankind. In this whole 'debate' it is as if the priest does not even exist, just the 'people' and Holy Communion. We so often call them 'our priests'. 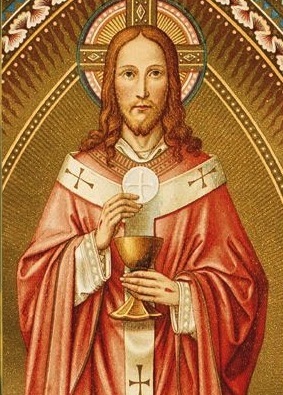 The priest is for us, but that means the priest is for our Salvation, because the priest is Alter Christus, he is for Our Lord Jesus Christ, not just conceptually, but in the very person of Our Lord. One conscience. ..why shouldn't it be your's or mine or Kasper's, or Bergoglio's or 'smoke of satan' Montini's?? It's supposed to be given, writ and taught infallibly; otherwise, Christ 'lied'; however cosy the mess is. The mess might support the cosy. Don't belive Christ supports this new age new order familiar mess. It seems to me Francis needs to be understood in terms of his formation as a Jesuit and the spiritual exercises. His whole life has been built on discernment through the exercises in light of the church. When one understands this, much of Francis' teaching on conscience via discernment makes sense. It is not my job to 'make sense' of the Pope's ambiguity which, so often, is self-contradictory, as if I have to do a course in Jesuit semantics and esotericism in order to understand him. It is, however, the Pope's job to teach the Catholic faith undiluted, in charity, with truth, guiding and educating the consciences of the Faithful and others. 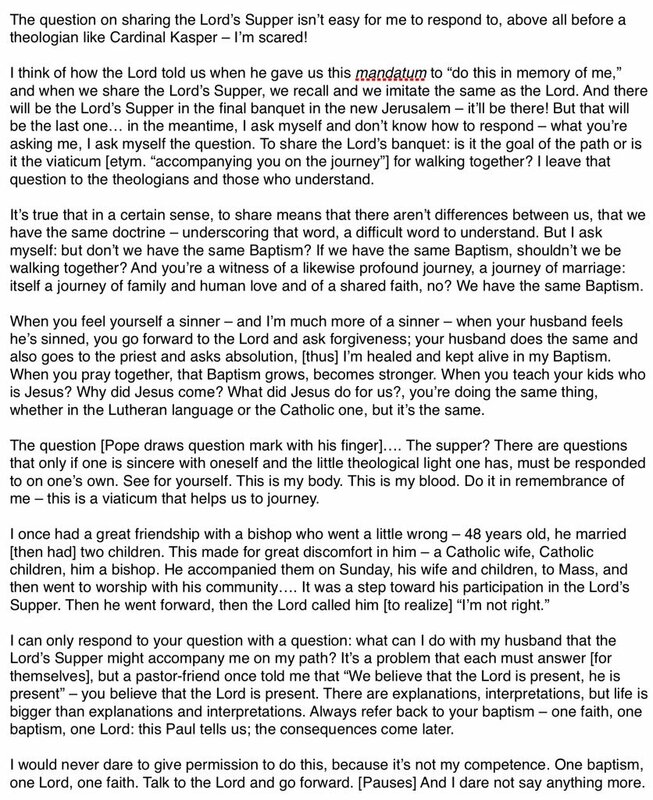 The answer to the question by the Lutheran woman is so simple and requires no great number of words. The answer is no, you may not receive Holy Communion, but should you wish to become a Catholic, and enter into full Communion with the Church and its Lord, then you may. She deserved better than a load of 'Jesuit' meandering followed by 'its not my competence'. Everyone is worthy of the truth! So I am happy that you have 'worked him out', but that will not help the great mass of humanity nor the vast majority of Catholics which include my mystified self. I am sorry if I was short-tempered or rude. I should be more careful with my words. The Pope's statements are doing my head in as much as they are the next man's, but that's no excuse. That said, I'm not sure anyone has this Pope 'figured out'. Does the Pope have the Pope figured out? There is no need for an apology. I'm in your house and your rules. I didn't mean to offend anyone with my thought. It's not that I understand Francis, rather I think I understand how he approaches people's difficulties. Francis is a very different Pope. I was born in the time of Pius Xi so I've seen a pope or two. Francis is the first pope I know to take his personality into the papal role. Others have understood the papacy as a role that they undertake. Francis does not. I can see how frustrating this can be to some people, and I hope Francis will understand the pain he can cause. May I say that in all my years I have never seen a pope so publically criticised by so many people. In my younger days it would be unacceptable, thankfully times have changed and open discussion is welcomed. As you may see I'm very appreciative of Francis but I understand how others are distressed. I find it very difficult to understand what on earth Pope Francis is on about when he waffles in this way. I wonder whether he understands himself. When he says that he does not dare say something who is he afraid of? God, the Bishops or whom? If I were Fr. Lombardi, I would start using the formula 'You might think that, I couldn't possibly comment' which is entirely appropriate in the circumstances. We all know exactly what he means, 'I would allow it but those nasty old traditionalists lack charidee and so I can only hint'. Girrard OP -- re: understanding PF's "jesuit" mind - may want to read up on it yourself from someone who knows. Indeed, might as well try 'understanding" lutheranism or any other heresy, 'cause it's the same thing. That being said, the critics have been saying for year's P6's 'mass' is as invalid as the Lutheran 'mass' and same w/P6 priesthood. In my view bergoglio who is a P6 'priest' has confirmed (if any confirmation was (still) needed). Of course, those who don't want to see will remain blind. Girrard OP: It is not because times have changed that there is such criticism but because none of us, who remember the papacy of Pius XI, have ever heard such incoherent and ambiguous waffle from a Pope and thoroughly uncharitable criticism of people of good faith. There must be a lesson for all of us here. How come every statement by Pope Francis is crystal clear to these people when it’s as clear as mud to the rest of us? They can even tell that when the Pope speaks interminably on the subject he is telling us beyond any doubt that the divorced and remarried can go ahead and receive communion. Quite uncanny. At the funeral Mass for Pope Saint John Paul II, Joseph Cardinal Ratzinger dispensed Holy Communion into th hands of Brother Rigger Schutz, a protestant of the Taize community. Back in the dark ages (1917 Code of Canon Law) dispensing Communion to non-catholics was verboten, period. Now, having applied the sacramental of Ecumenism (the Universal Solvent of Tradition) to everything we now have a new Code of Canon Law that makes dispensing Holy Communion to non-Catholics jake - and not just for parodies about to croak. 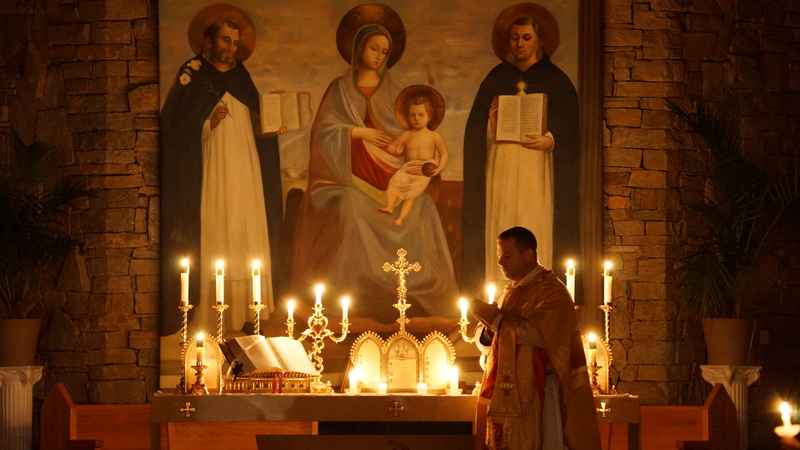 I have come to believe that there are probably very few real priests left in the Vat 2 church ( only those ordained before 1968) and probably no real bishops.. Archbishop LeFebvre believed the new ordination rites were questionably invalid and the new bishop consecration rites were definitely invalid. If there are no true bishops then there are no true priests. So perhaps it is only bread and wine and if so why not give it to a Lutheran? Or a Wiccan or a Muslim? Seattle Kim: There are plenty of good priests in England at least and of course plenty of pretty useless ones. Father Blake is one example of a very good priest and several other names spring to mind. Those ordained more recently are usually good and in particular those who have come over from the Anglican Church. Gradually they will rise to the top and things will change. How much longer can we pretend that Mr. Gates of Hell is the vicar of Christ? He's only hard to understand by those who don't want to. He's clear whenever he's talking about an unrelated matter, but the minute his words reveal him to be a heretic it's all unclear and ambiguous.